Last weekend I went up to Salt Lake to visit my family and dear friend Kandice. She got married a couple of weeks ago up in Oregon and I wanted to hear all about her big day! They're throwing a reception on Friday and I'm SO EXCITED for it! She was showing me some of the decorations she's made and what she's going to need my help on. The reception is going to be lovely!! I will make sure and take lots of pictures and steal some of hers ;P After Kandice showed me everything she had planned, we went on a little group walk. Unfortunately, I left my camera at my parents so I didn't get to take any pictures. However, you can CLICK HERE to see a picture Kandice shot of us on her instagram. I've been obsessed with chambray tops lately and when I got this lovely number from Oasap last week I was so excited! I've been on the hunt lately for a cropped chambray top and this one fits oh so nicely. I decided to style it with this vintage floral dress I thrifted months back, a simple gold chain, and my new favorite shoes. PS: CLICK HERE to see if you are the winner of the My Life in Lavender Giveaway! 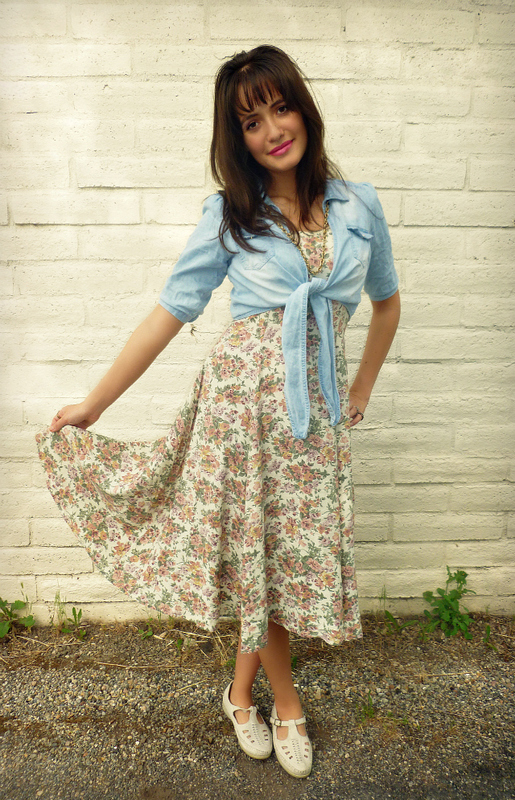 the cute floral dress with this denim top is amazing. great outfit! Lovely thrifted dress and shoes, A girl after my own heart! really like the way you styled the crop top!! Great pics and colors. I love this floral print on you! 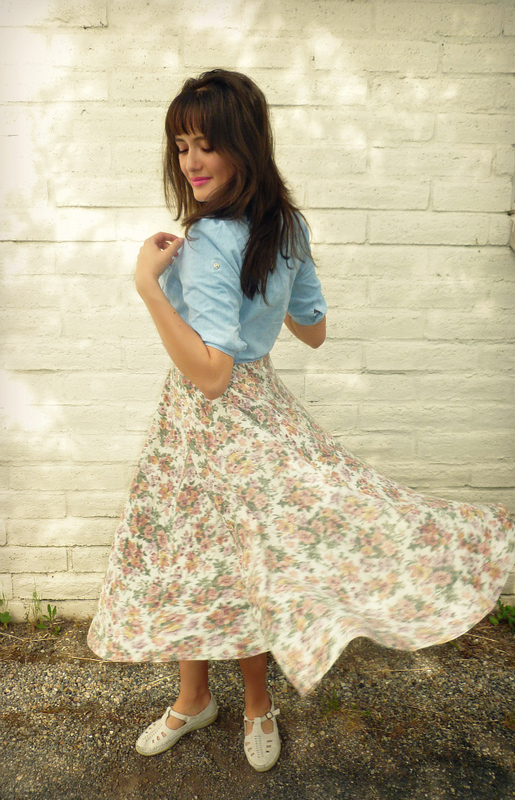 I love the spinning picture - what a perfect skirt to do it in! And your accessories are lovely. oh my, I love this combo. Chambray and floral looks so great together. I will definitely be doing this too! also, it was fun hanging with you, ti, and dakota. this is a very cute outfit. I love the washed out tones. It reminds me of an early 90s outfit. Love, love, love this whole outfit! You look so pretty! i still love your ultimate punch jewelry shots. they're the best out there. you look amazing, as always. and i want your shoes (again, as always). Stunning dress, you hair looks amazing! That is the cutest outfit!!! Oh my gosh!!! Super cute! I love the first picture of you twirling. Very cool rings & beautiful diamond ring!! I love the pink lipstick too! Cute outfit! 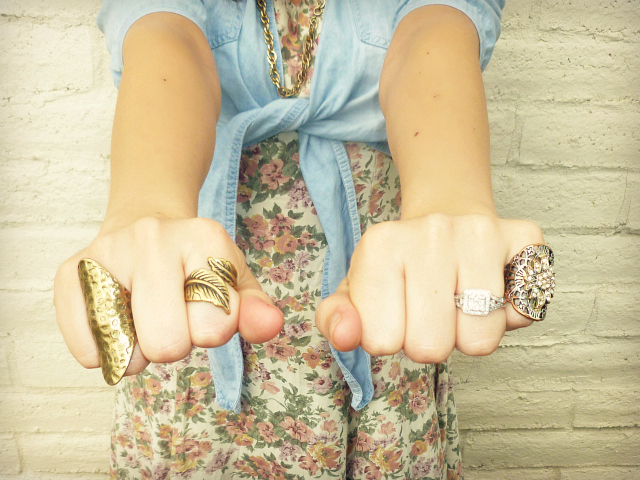 I like your rings and the combo of denim and floral! Thank you! I don't have anything lined up yet, I am planning to teach on my own at a community center and possibly at the gym. I'll keep you posted! aww great outfit, i love the skirt and all your jewelry!! love the dress you look so pretty and love your jewelry!!! love the outfit and love the shoes. Following you. We recently launch an online clothing store at www.shopgnoix.com. Come check out our blog and our online store.